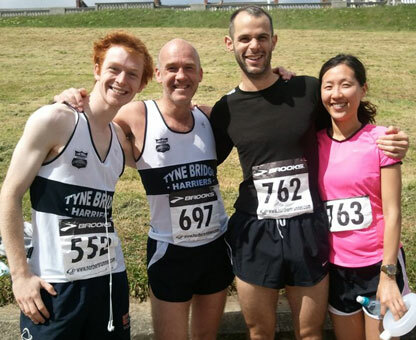 While the club’s marathoners headed north to the Scottish capital for the two big races of the day a small contingent of Tyne Bridge Harriers made the shorter trip south of the river to what must be one of the most scenic races in the region, Sunderland Strollers’ Pier to Pier. The day before the event the Strollers stated on their website that the race day weather was a little unclear and this was certainly the case as it proved to be the definition of four seasons in one day. Thankfully thought the hail wasn’t unleashed till most runners had crossed the finish line. It was however the wind along with the copious amount of dog mess which proved to be the biggest obstacles during the 7.5 mile run. Yet again there were some fantastic, eye catching performances by our runners over a course that started on the sand of South Shields beach taking the competitors across cliffs, stony paths and steep steps and finishing back on the sands of Sunderland. Sparrow Morley, Dan Birchall and Gosforth’s finest Emily Collinge hared off down the beach in pursuit of the leaders, finishing in impressive style. 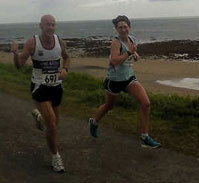 Sparrow was quicker than the local seagulls and was first home of the TBHers in 32nd place (of over 750 runners!!) in a time of 46:18. He’s getting stronger with each race and is with out doubt addicted to the sport and can’t seem to say no to any challenge at the moment! Emily wasn’t far behind finishing in a time of 47:58 and the 4th female home and more importantly taking family honours by coming home in front of both her parents, though it is certainly worth noting that her mother was first female 60+, proving that Emmie is blessed with some good genes. Dan completed this top trio finishing in a time of 48:52, which stands him in good stead when taking on his son in the Blaydon next month. Louis running with his girlfriend Kayoung, of the mega sized London club Serpentine, finished within their target of an hour completing the course in a few seconds over 59 mins which made their post race coffee cake all the more enjoyable. Special mention also to two of Dave Moir’s lunchtime torturer session attendees; Alan Bell (55:18) and Peter Njoroge (55:23) who also put in sterling performances, which hopefully makes all that pain worth while! Many thanks to Sunderland Strollers for putting on such a fabulous and well organised event and also to all the Mackems cheering us on, even if we were in the Black & White of their arch-rivals. As seems to be the recurring theme it was the overriding sense of enjoyment had by all which was the dominant factor of the day, regardless of what either the weather or the canine population of South Tyneside could throw at us and this is manifesting in some terrific times! Well done to everyone, some cracking times posted. Great report Louis. Hope you and Kayoung enjoyed it. 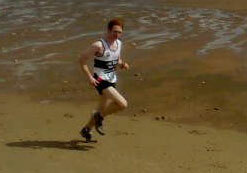 Thought it was one of the best races I’ve done, def recommend itl. Daniel kept me going when I was flagging in the middle. Can’t believe how fast the first woman was, she was 8th overall! mental. Such a fantastic day, loved the community of TBH that was present there – friends and family really made the day with their kindness! Yes Dan, I do wish I’d have realised where the finish was haha… “Oh my life there’s the finish, we’re almost done, better step it up!! Certainly going to try the route again sometime next week and see how I fare with a bit of course knowledge!